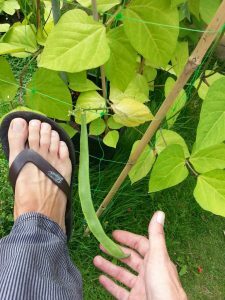 The Runner Bean is a legume. Legumes have evolved alongside a series of microbes, specifically Rhizobium, which is included in our Better Organix Root Better Product. This noodle-forming microbe attaches to the root structure of all legumes, where it biologically fixes Nitrogen from the environment. It is detrimental to feed legumes nitrogen based fertilisers because of this preference toward biological N symbiosis, so the addition of manure can also be a good idea in low organic media or in pre used soils etc. Bio-Media Pro contains a bounty of beneficial soil microbes that assist in the growth & health of all legumes. K+Amino contains high levels of valuable organic Potassium & includes further benefits via added micro elements such as Calcium, Magnesium, Zinc, Copper, Molybdenum & Boron, it also has a rich vitamin content including A,B Complex, C & E. All assist plants at times of high growth while also providing valuable stress relief from environmental factors such as high heat, low light & drought. To further enhance internal biological systems such as internal sap regulation, K+Amino also includes bacterially activated Silicon & this is further boosted by the use of Bio-Balance Media which contains a full complement of organic acids & Potassium. The organic acids work to both maintain overall plant health & vigour, while clearing the root zone of free radical ions, so helping optimise the growing media. It introduces more Oxygen to the root zone, so helping both plant & evolved partner microbes to work at peak rates. Bio-Balance Media acts to chelate elements such as Calcium. This action helps keep vital plant growth minerals in an instantly accessible plant form, while preventing them from binding with other elements such as Phosphates in the soil, locking them away from our plants, or worse, washing them out of our spaces & into river systems causing wide spread system imbalance & expense. Regular feeds with Bio-Balance Media can help our plants retain access to vital nutrients, while protecting our critical soils from damage. Growing legumes is both rewarding from a human perspective, but more, the plant group can help us restore lost soil Nitrogen & is so beneficial to the wider ecology & sustainability of our land.